Oh, hi. Yes, I’ve been sleeping in…and attending to very important matters like feeding my donut obsessed self these nearly guilt-free Chocolate Glazed Baked Chocolate Donuts. At 93 calories a piece, there’s no denying they will be the best spent calories of the day. And I’m excited, too, about all things going on with this here, the blog (P.S. preventionrd.com will be getting a “face-lift” come February!). January has been a booming month, and I think I can attribute that to the healthy goals people set come the new year. Despite the cold, snowy, I-just-wanna-snuggle-on-the-couch-and-read-a-good-book weather, this time of year is filled with good intentions to eat well and be a healthier, happier you. I think that’s a great goal any time of year…but there’s something very motivating about having so many people working towards the very same goals, at the very same time. People, we are so in this together. I have “seen” new faces on Facebook (I’m lovin’ it). I’ve had the chance to check out new healthy cooking and living blogs from the comments and emails you’ve sent my way, or tweeted my direction. And more than ever, I feel that those coming to my little corner of the web are actually trying and loving the food that I prepare, photograph, and post about. For me, it doesn’t get any better than that — so, thank you. Preheat the oven to 450 degrees and coat a donut pan liberally with cooking spray. Stir together flour, cocoa powder, sugar, baking powder, and salt in a large bowl. Add the egg, milk, vanilla, oil, and applesauce; stir together for 1 minute. Fill each cavity in the pan 1/2 of the way full with batter. Bake for 7 to 8 minutes or until the donuts spring back when lightly touched. Cool completely. Meanwhile, melt the chocolate in a microwave safe bowl. Add the corn syrup and oil and microwave in 20 second increments, stirring in between. Stir in the vanilla. Dunk each donut into the glaze and allow to set. Yield: 14 donuts. Result: Oh my yum! 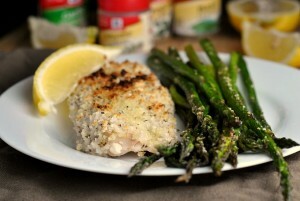 I slimmed down this recipes bunches and it was still delicious! The glaze makes it. These come together quickly and are good for several days afterwards. Is there anything better than a chocolate glazed chocolate donut…for under 100 calories a piece? Nah. Since I’m in a great mood today and feel far too selfish to post yet another donut recipe while so few of you own a donut pan (seriously, you NEED one)…let’s have a little GIVEAWAY! Leave a comment on this post letting me know which of the following donut recipes you’d be most likely to try if you won a donut pan! I will draw ONE winner at random tomorrow evening, 10pm EST. Yum, I’m still all about eggnog 🙂 Your donuts look delicious! I’m too distracted by the donuts to think of any else. These are making my mouth water! I seriously don’t know why I don’t own a donut pan! I think I missed the day you posted the Orange Glazed Blueberry Doughnuts.. now I can’t stop drooling! Chocolate 🙂 These look so yummy! The pumpkin spice with chocolate glaze sound delicious!! Definitely the Baked Apple Cinnamon!!! Love all the recipes you post! Seriously, these look amazing! I need to make those eggnog donuts. I still have some eggnog frozen from Christmas so I can enjoy them year-round! It’s a hard choice between the chocolate and apple cinnamon donuts. I think I’d have to try both! 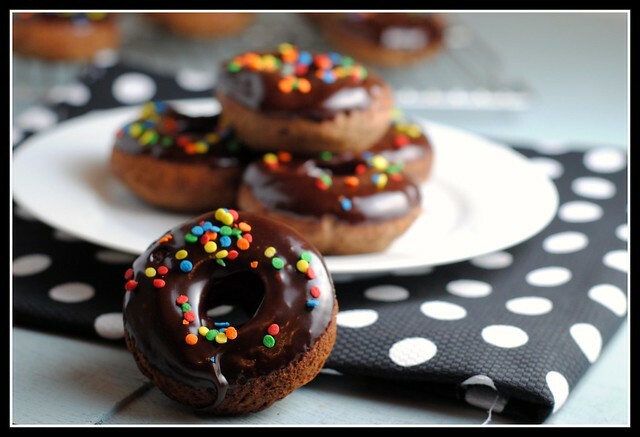 Definitely love chocolate and that is why I would make the chocolate glazed baked chocolate donuts! You have wonderful recipes and this one is my all time favorite. Eggnog Donuts! It can feel like Christmas all year! The baked apple cinnamon doughnuts look phenomenal! If I ever get a donut pan I will totally make them! In the meantime I’ve been making awkward-looking donuts on a baking sheet. I love it! That’s great!! Ooh – I’d definitely try the pumpkin or eggnog! Yum! I love anything pumpkin but the idea of an eggnog doughnut is very appealing too! Double chocolate donuts from today–probably would use chocolate sprinkles to make triple chocolate! I’ve made the pumpkin spice donuts with chocolate glaze and they are amazing! I’d like to try out the apple cinnamon donuts. I love chocolate chip anything so I would definitely try the chocolate chip ones. Yum! I love orange anything, so I think I would make the orange ones first, closely followed by apple cinnamon. 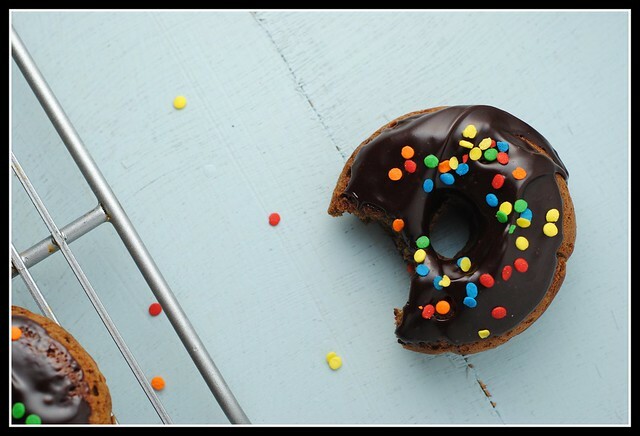 I love donuts…they are my highest ranked “I shouldn’t be eating this food.” But your pictures look so amazing! Oh, my. If I had a donut pan I would try all of your recipes! They all look so good. But I think the first one I would make is the “Healthy” Baked Chocolate Chip Donuts. YUM! Oh, and these look heavenly! Toss up between the chocolate chip donuts and the orange and blueberry donuts. Both look delicious! The orange glazed blueberry ones for sure! I’ve been eyeing that recipe for ages….LOVE fruity desserts :). 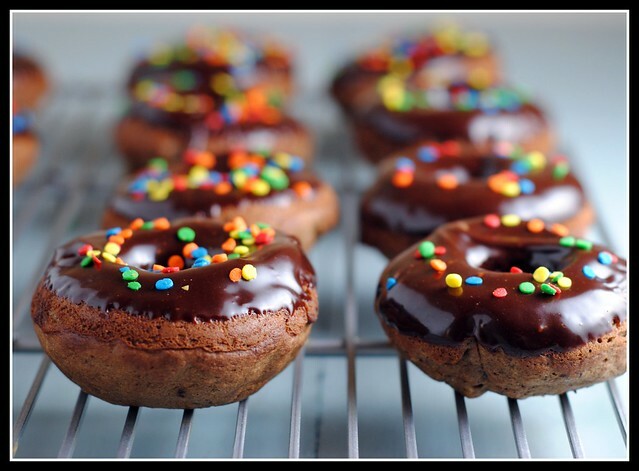 I would probably make these chocolate glazed chocolate donuts. The orange glazed blueberry ones look delicious too!!! It would be difficutl to decide between making the pumpkin spice or the chocolate. If I won a pan, I am sure I would make both! I’m all about the chocolate donuts. I LURVE CHOCOLATE! I would definitely try the pumpkin spice with chocolate glaze! Tie between eggnog & pumpkin spice – i still haven’t gotten over either seasonal flavor! Pretty sure I would try all of them 🙂 But I think the chocolate chip is first on my list. That’s a really tough decision! I’d probably start with the pumpkin spice and then make my way through the rest -one delicious donut at a time!! i would try Baked Apple Cinnamon Doughnuts first. 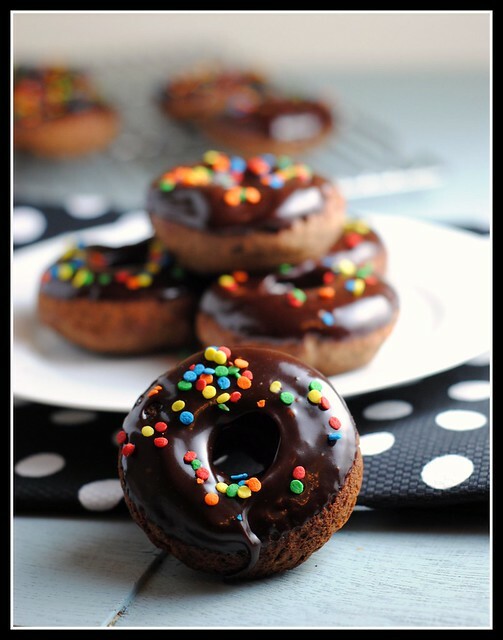 I would absolutely be making these Chocolate Glazed Chocolate Doughnuts first because… YUM! But I think I’d quickly move on to the Orange-Glaze Blueberry doughnuts because they sound unique and yummy! These all sound delicious but I would have to try the Apple cinnamon ones first. Thanks for sharing! I have been wanting to make donuts for so long. I think the Baked Apple Cinnamon Doughnuts sound so good! Thanks for the giveaway! The Baked Apple Cinnamon Doughnuts sound great and I would want to try them, but I would quickly find a recipe for maple doughnuts – my favorite! Definitely the Orange Blueberry! 3 Points! How can you go wrong? I really hope I win or I will have to get myself to BBB to buy a pan! I wouldn’t mind trying your apple cinnamon doughnuts. That sounds like a yummy way to start the day. I’d love to try the Pumpkin Spice Donuts with a Chocolate Glaze! YUM! We would DEFINITELY make the pumpkin donuts with chocolate glaze. Yum! Ohh, Orange Glazed Blueberry Doughnuts! They all sound delicious. I have never made a doughnut, although I bake weekly… May have to try this. Thank you again for sharing all this deliciosity! apple cinnamon for my husband! It would be a toss up between either the baked chocolate chip or apple cinnamon donuts…they both sound delicious! The pumpkin with chocolate glaze! My favorite flavor combo. Chocolate chip donuts for sure. I am sure my kids would love them! Umm definitely the Orange-Glazed Blueberry! Baked eggnog donuts for sure. I’m an eggnog freak. Never understood why it’s not a year round treat. Your photos are gorgeous! oooo, it’s a toss-up between the pumpkin spice and the apple cinnamon. I would love to try both! Hubby has been bugging me to make donuts too, but I don’t want to fry them! I want to make the orange glazed blueberry doughnuts first. They look so good. Oh, it’s for SURE the apple cinnamon donuts! Anything rolled in cinnamon sugar makes my heart go pitter-patter!! YUM! Orange-Glazed Blueberry Doughnuts Me LOVE blueberries!! I would like to try the chocolate chip donuts. Defintely the blueberry with orange glaze, they sound AMAZING. Love all of your recipes. I would love to try the apple cinnamon then the chocolate ones. Wow those chocolate donuts are bootiful!! I’d try those first then the pumpkin ones. Thanks for the recipes! And now the need for another gadget! Um, let’s go with all of them? Glad the new job is going well. The healthy baked chocolate chip donuts look the best to me although it’s very hard to choose. They all sound good. The pumpkin spice ones, love anything pumpkin! I couldn’t really decide on just one, but I’d definitely like to try orange-glazed blueberry doughnuts, chocolate chip donuts, pumpkin spice donuts, and the apple cinnamon doughnuts. I just found your site and I am loving it so far! Thanks!! Chocolate Chip! I’d have to save one and send the rest to work with my husband so I didn’t eat them all. YUM DONUTS! Oh wow! That’d be a tough one….it’s a tie between the Chocolate Chip & the Pumpkin Spice! I really cannot decide! All of them look so extremely delicious, but if I had to pick one, it would definitely be either these chocolate glazed chocolate donut or the chocolate chip ones! guilt-free way to enjoy chocolate desserts for breakfast? I’m in! Pumpkin Spice Donuts with a Chocolate Glaze! orange glazed blue berry donuts! They sound delicious! i would love to try pumpkin doughnuts! Mmm definitely the orange blueberry. Those sound great. Or the apple cinnamon or chocolate. Oh I can’t decide on ONE donut! First off, your donuts look awesome! Super pretty and tasty looking! I would love to give the pumpkin donuts with chocolate glaze a try. Sounds amazing. Glad to hear you are enjoying your new job. Sounds interesting. If I had a donut pan, I would definitely make your pumpkin spice donuts! Pumpkin season is never over in our house. WOW! The chocolate donuts look beautiful! I love the multicolor sprinkle on it! I don’t even want to think about how good they must taste. I’m trying to loose the babyweight 🙁 so no sweets for a little while. These look awesome but I think I would try the eggnog first! I would most definitely try the Baked Apple Cinnamon Doughnuts first, with this pan. I absolutely LOVE the smell of apples and cinnamon baking in the oven, which is just amazing any time of the year. I can practically smell them already! 🙂 These all look great! I’m all about the pumpkin spice donuts! I love me some pumpkin!!! I have 2 little ones at home that love donuts too, and how convenient (and healthy) would it be to make them at home from scratch! I would have to try the pumpkin donuts first, but they all sound delicious. Love your blog!! They all sound good, but I’ll go with the chocolate one. HA! I will leave this one to your other readers. Nick and I have the WORST sweet tooth and I can’t even imagine life with a donut pan in our house!! Scary (it’ already bad enough with the ice cream maker). I’m impressed with the stats of these donuts though, only 15 grams of carb and less than 100 calories?! Damn. Not bad. Glad your job is going well, so far. You get to do TPN for dialysis patients?? Seriously, I’m impressed. I’d love to follow you for a day. Can’t wait for the facelift! Who are you hiring to do it? I need a change on my blog. If I won the donut pan (which I was seriously thinking about yesterday how badly I want one), I would most likely make these donuts because they look fantastic and they’re right above me…well, I wish they were right above me in real life and not a computer screen hahah! Would love to make those baked apple cinnamon doughnuts! Oh My! 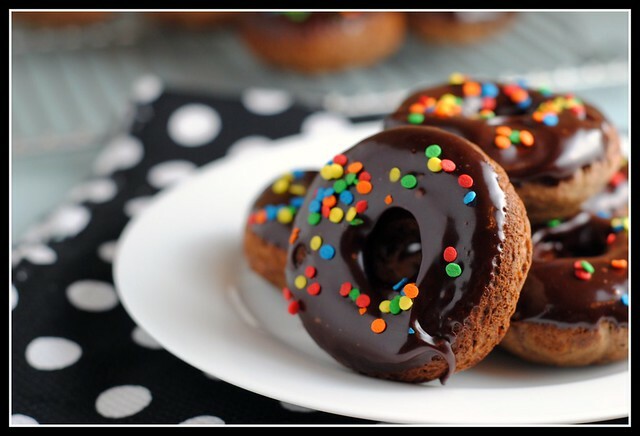 These chocolate-glazed chocolate donuts looks amazing! My husband LOVES chocolate and would probably drool over these. I think I would start with the chocolate chip ones, but these ones look amazing! I love all things pumpkin! I would definitely make the apple cinnamon doughnuts! I’ll have to try to make them gluten and egg free for my son but the recipe looks like it could be adapted pretty easily. And it’s much healthier than a GF/EF donut recipe I found on pinterest recently! Haha – I will be making the exact same ones – matching sprinkles and everything! Can’t wait! Yum! The Pumpkin with Chocolate Glaze sound amazing! Any donut that involves chocolate is a winner in my book. I am the biggest chocoholic, so both the chocolate donuts and the chocolate chip donuts sound great! And as a nutrition major in college, having these low-calorie options appeal to me greatly! No shame in more donut recipes!! Is “all of them” a valid answer? Donuts and I…. we have a thing. I would love to make the Pumpkin Spice Doughnuts with a chocolate glaze- YUM!!! And it’s been amazing to see your blog grow and flourish. You have done a fabulous job! BTW, does your new job mean that you may be attending a conference in my area again at some point? Would love to hang out again! Oops. I would like to win a donut pan, but I didn’t answer your question! 🙂 So the first donuts I would make are the apple cinnamon donuts! I would love to try the healthy chocolate chip ones!! I’m so glad you liked these! I will definitely try your spin on them when I make them again. As far as which donut I’d like to try, you know I loved the blueberry orange ones so next I’d like to try the chocolate chip! Yum! The Apple Cinnamon ones, for sure! This one or the Pumpkin Spice… Oh my! I have already tried the orange glazed blueberry. The only problem with them was that they were too good! I ate 4! I think I will try these as soon as I get some almond milk. Thanks for the great recipes! Apple Cinnamon! Tons of apple orchards in MI, the donuts would be an AMAZING use of apples in the fall. 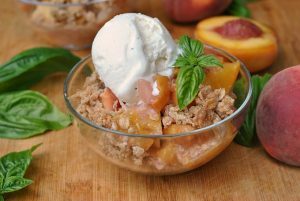 I found your website on foodgawker and I LOVE it! Tomorrow is my husband’s birthday and I am going to surprise him with your apple cinnamon doughnuts, the chocolate doughnuts, and your pumpkin doughnuts tomorrow to take in to work! Can’t wait to get to know your blog better! I would definitley make the chocolate chip donuts. The chocolate ones you posted today also looks delicious. i would make them all nicole, they all look great!! Definitely the chocolate glazed. A donut pan would be fun for sure! The chocolate! I can’t wait to make them! Chocolate chip donut for sure! My love of chocolate makes that an easy decision 🙂 Love the giveaway! I would love the pumpkin spice doughnuts or orange glazed blueberry… And i would LOVE a Doughnut pan! Such a great giveaway – I’ve been wanting one of those pans! No question about it, I’d have to try the chocolate recipe first!! The orange-glazed blueberry doughnuts were the first we made & are definitely our favorites!!!!! I’d be most likely to try the pumpkin spice with chocolate glaze or these chocolate with chocolate glaze. I adore cake donuts and since loosing 62 pounds in 2011 I haven’t had one in over a year. But the numbers you are getting would pretty easily slip into my nutrition guidelines. Thank you! MMMM I would definitely love to try the pumpkin spice ones! I am desperate for a donut pan. I can’t find one anywhere, and should I ever get my hands on one, I’d be making the apple cinnamon donuts first. Apple and cinnamon is one of my favorite combinations. And btw, I’m so glad your first week went well. Starting a new job is so nerve racking. apple cinnamon or pumpkin for me! chocolate for the boyfriend! I would definitely make the chocolate chip ones. orange glazed blueberry are so different from what i would normally make that I think that’s the best way to start! OMG….I would make these donuts. Soooooooooooo gorgeous, I can’t stop looking/drooling/dreaming about them. Send me and cookie some puh-pllllllllllleeeeeease!!!!! Plus, I can’t wait to see your new makeover…how exciting for Prevention RD! I would definitely try all of them but I think I would try these ones first. They look so delicious and they are less calories than a special k bar! Are these made in a regular size donut pan (i.e. 6 donuts per pan) or the mini donut size? I’m hoping for regular, but just want to be sure. Thanks! I tried the chocolate glazed donuts today and really had a hard time with the glaze, it seemed a bit chunky and I was scared to keep microwaving it because I didnt want to burn it 🙂 Not sure what I did wrong. I think next time I will just buy a chocolate glaze frosting!! Thanks for the recipe! This happened to me too! I LOVE the look of your glaze so I tried making it twice, and both times it got really chunky and thick when I added the oil and corn syrup. Tastes delicious, but any thoughts on the texture? Your glaze looks so perfect and I’d loved to replicate it! One more note: if it still seems to be clumping up, add just a bit more oil. Wax is an option, too 🙂 Paraffin wax can be found near the canning goods in grocery stores. Oh my… these look like the best things EVER! Gorgeous pics!!! For some reason, most grocery stores don’t have pastry flour though! I really want to try these, so do you think cake flour would work, and how would the nutritional info be changed? Would it be higher or lower? Thanks!!! What can I use in place of corn syrup? Can I use agave? I am using the glaze to put on your pumpkin buttermilk donuts! I would love to try the chocolate chip donut recipe!! are these average size donuts or mini donuts? Not mini, but on the smaller size of average. 3 1/2-4 inch diameter?